The sea surface temperature (SST) varies much more slowly than atmospheric temperatures due to the heat capacity of water. As such, the SSTs lag the atmospheric temperatures on a seasonal timescale by about 3 months. The lowest SSTs are usually observed in early Spring and the highest SSTs are observed in early Autumn. 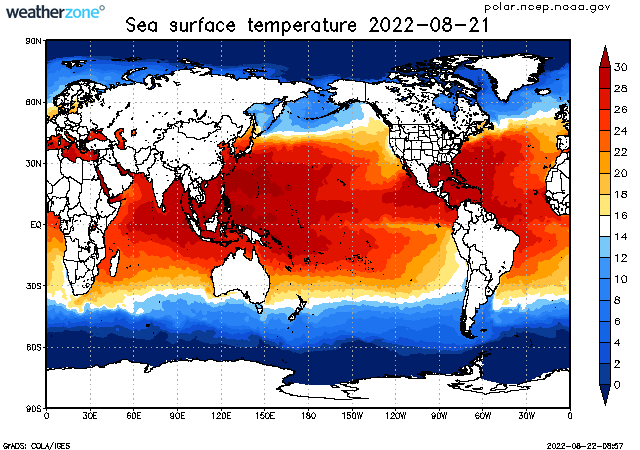 In tropical regions, SSTs greater than 26°C are considered suitable for formation of tropical cyclones. The data displayed in this map is the weekly average, centred on the date shown.